Mc-Seal is an epoxy, resin-based, multipurpose sealant with a unique combination of epoxy putty and adhesive. Mc-Seal has carved its name in India due to its 4-in-1 applications. It has established itself as the market leader in the Plumbing range by successfully extending into adjacent product categories like solvent cement, liquid sealant, PTFE tape used in plumbing repair and new construction. Thus making it one of the most trusted brands with the largest range of plumbing products. 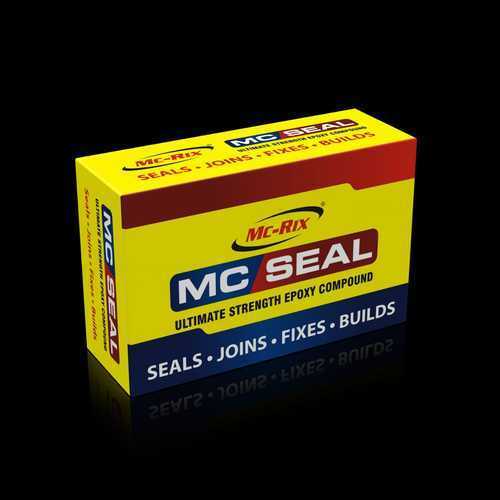 Mc-seal is a multi-purpose sealant with 4 main applications – sealing, joining, fixing and building. Its versatility and ease of application makes it commonly used across multiple industry segments, as well as households (DIY) who can use it to mend broken articles, fill gaps, cracks and plug leaks in pipes and joints. MC-Seal is a great asset to the plumbing industry and is used by plumbers, plumbing contractors, auto mechanics and households (DIY) for repair and new construction segments. Degrease, Clean and dry the surface before application. Apply homogenous Mass within 2-3 minutes of kneading. Smoothen epoxy putty while still sticky with a wet cloth or by pressing a polythene sheet on the sticky surface and peel of the polythene sheet after curing. Initial setting time is 30 minutes after application at 27ºC. PRECAUTIONS: Do not use on any surface which is flammable. wash hands with soap and water after use. Components : 2 Components – Resin & Hardener. Mix Ratio by volume – Resin : Hardener :: 1:1w/w and 1:1 v/v.